I guess the comparisons betwen Rachael Ray and Martha Stewart are inevitable. The media likes to create these rivalries, don't you think? Tons of articles have recently been published on this issu. The most recent is from the Star Tribune, which interiewed Martha about her talk show and mentioned that Rachael's show is beating her in the ratings. The interviewer asked if Martha considered Rachael as a rival. Martha responded: "I don't even know Rachael Ray other than having seen her on television. Their program is very different from mine ... she's much more a cook and comfortable in the kitchen. My expertise is the home." A I'm much older than Rachael Ray. I'm much more experienced. I'm much more knowledgeable. I don't think I would lose a contest. Q But just for fun, what's one of your specialties you would challenge her to make? Next thing you know the MSN's Big Debate took on the issue of who is the better domestic diva. I have to say I agree with Martha on this one - she and Rachael are so different that it's like comparing apples and oranges. Some articles, like this one in the Daily News Tribune take this apples and oranges approach, but put a negative spin on it by calling Rachael the Anti-Martha. Since the late 1980s, Martha Stewart has reminded overworked, stressed-out, time-crunched young adults that they are a bunch of shiftless, lazy, good-for-nothings because at a dinner party they once served - gasp - frozen peas. Rachael Ray has become wildly popular because she isn't like that. She let's her audience know that it is all right to cut corners to save time. Time that can better be spent doing other, more worthwhile activities, such as watching Rachael Ray's daytime talk show, or reading Rachael Ray's magazine. Instead of calling Rachael the anti-Martha, I like to think of them as attracting different audiences. 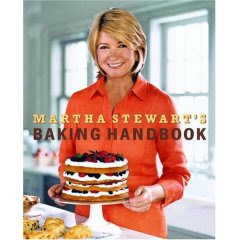 Those that want to learn how to create that five-tier wedding cake can buy Martha's Baking Handbook. Those of us who have neither the time nor the inclination to create a five-tier cake can buy Rachael Ray's Express Lane Meals, which includes recipes that can be made this 10 or less ingredients if you keep you kithchen properly stocked. I think I know which category I fit into, but I don't think there's any reason why someone couldn't fit into both! I agree with you. There's no reason why you can't be both. I like RR because I can create a quick meal with her recipes when I am time-crunched. But then there are those lazy Sundays where I don't mind spending hours in the kitchen and I can make one of MS's recipes. Cate - I hadn't heard of that one! I will have to check it out to see what Martha considered fast. Dani - I guess it's just because the media tries to create conflict, despite the fact that many people like you think there's a place for both of them.